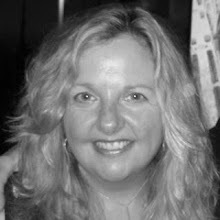 When I'm in the city, I dream about the farm stands and markets in the Hamptons. Inspired by the abundance of fresh mint in my garden and the English Peas that I bought yesterday, I pulled together what I'm calling Aw Shucks! English Pea Salad with Bacon, Scallions and Mint for Day 2 of Edible East End's Festival of Seven Ingredients Challenge. 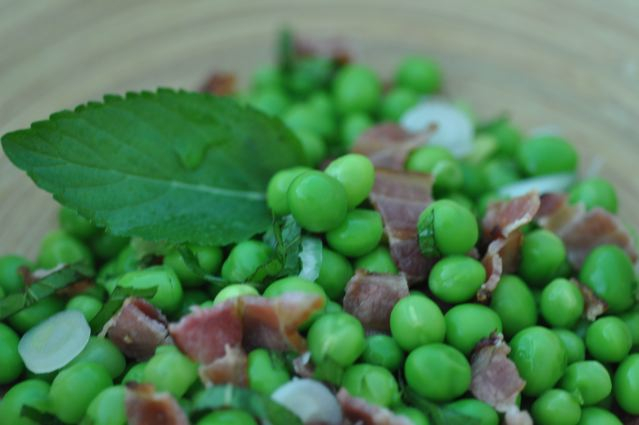 Last month, I had an amazingly springy pea salad at one Chicago's top locavore restaurants, The Purple Pig, which inspired me to make this salad using local English peas from Polak Farm in Aquebogue on Long Island's North Fork and mint from my garden. Purple Pig added pecorino cheese and pea shoots to its recipe -- I decided to forgo the cheese and couldn't find any pea shoots. If you can find the pea shoots, they add another dimension to this inspiring salad. The salty crispness of the bacon makes this salad truly amazing. 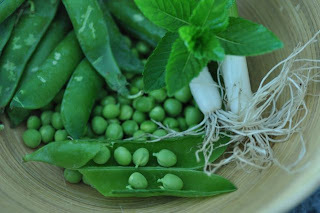 Working over a bowl, shuck the peas and set aside. 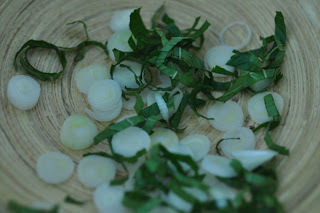 Wash and slice the white part of the scallion for the salad and save the greens if you make homemade vegetable stock. Cut the mint into thin strips, using the chiffonade method. Add cooked peas and bacon bits and dress with oil and vinegar. Set aside for several hours to let the salad marinate before serving. Working over a bowl, shuck peas. In a medium saucepan, boil water and add peas. Cook for 3-5 minutes just until done. Strain and cool in a bath of ice water. Set aside. Cook 4 strips of bacon, let cool and cut into small pieces. Set aside. Slice mint and scallions. Set aside. When ready to assemble, add all ingredients, toss and refrigerate for 2-3 hours. Garnish with fresh mint. Serves 2.